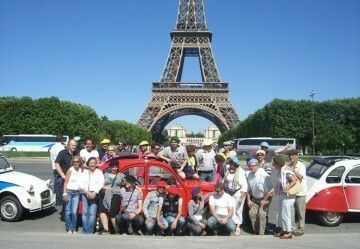 There are many different possibilities with Paris Authentic’s 2CV trips. Whether it’s a simple discovery of Paris, a relaxing interlude for your guests, a gift, or a trip down memory lane to bring back those images from childhood, the Paris Authentic 2CVs and drivers are there to bring to life a unique retro experience in a charming environment. 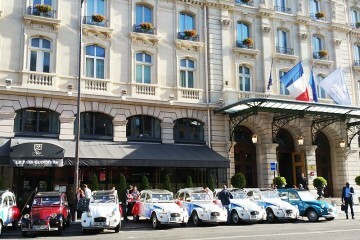 For a real guided visit, our Parisian drivers come and pick up your group from wherever they are in the city. Personable, fun and professional, the multi-lingual drivers (English, French, Italian*, Spanish* and German*) know how to receive your guests and surprise them with an off-beat experience the Parisian way. Each driver will take great pleasure in revealing ‘his Paris’, the places which he knows and loves, for an unforgettable interlude. Which itinerary will you choose? Perhaps the great traditional sights if it’s your first time in Paris, perhaps something unusual if you want to surprise your guests who think they know the city ... or why not a bespoke trip especially designed according to your wishes? 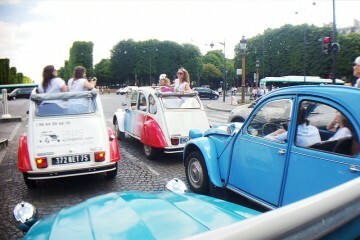 Flexible to your needs, in a 2CV anything is possible! Think of our little 2CVs for your transfers! 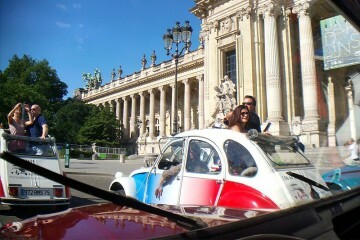 Your 2CV comes to you! Wherever you are in central Paris, get a taste of luxury service with a pick-up spot of your choice, then set off on a really different trip. The drop-off point too can be wherever you choose. Looking for a different way to do your transfers ? Here it is! Your guests will be surprised, smiling and enthusiastic at the mere sight of our vehicles. The 2CVs of Paris Authentic are the ideal transport solution for all your transfers within the city.